Very good location. Walking distance to train station and the Accademia--which will lead you to the other tourist spots as well. Only (minor) downside is that wifi is only at the lobby. This hostel is cute and within walking distance to the Duomo and several other sites. It’s great because it is 5 minutes from the train station as well. The reception is only open for a few hours a day, which isn’t an issue if you arrive in the morning! Otherwise you just check in on your own. Rooms are large, bathrooms are nice and there’s a full kitchen too. I just wish there were storage lockers but otherwise the place is very secure. The place was cozy and clean. The atmosphere is really quiet, which is great (unless you're traveling alone and wishing to meet people: don't expect the usual happy hostel life in the common area, though there is one). 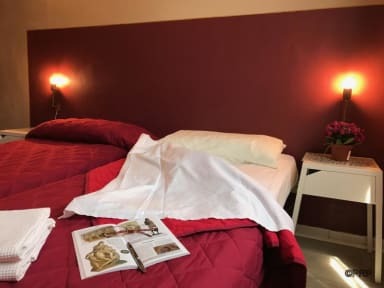 I only hated the fact that no facilities at all were included in the price: we even had to pay €5 for the bed linen, which I think is simply absurd. Also, the opening time of the reception desk (a couple of hours only in the weekend) made things a bit complicated. The hostel has a perfect location in a street with lots of restaurants and within a 5 minute walk from the cathedral. The room was very clean and spacious. We had booked an ensuite bathroom but is was located across the corridor. 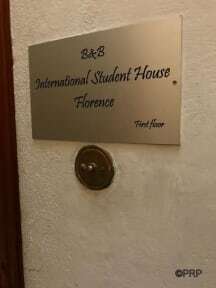 It is a small property with only a couple of rooms, it is perfect if you want a relaxing city break in Florence. The staff is very kind. Perfect location near the terminal. The house was organised and cleaned. But there were a lot of mosquitoes. The staff didnt know we booked a private room and gave us the wrong room at the first time. The Wifi wasn't working. The bedroom had good beds and a small bathroom outside our door. Good location, friendly staff. But for the number of rooms there is not enough shower/toilets, and although there was an aircon unit in our room there was no remote - and with manned reception hours being extremely limited there was no opportunity to ask for one. This was a problem not only because the room became very hot at night, but the window of the room had been left open before we had arrived and let in a huge number of mosquito's which then bit us throughout both nights - unpleasant! This hostel was “so-so.” It provided the amenities needed by a traveler such as blankets, pillows, etc. It also had a kitchen. However, it did not provide any safe places to lock one’s belongings in. Also, when I tried to blow dry my hair, there was a power outage. There is never any staff around to greet the guests or to be there when problems arise. While we enjoyed having our own independence and own room as it gave a bit of privacy compared to other hostels. We did find many things strange and that felt a bit odd. The air con wasn’t free and it cost €10 for a day meaning that the bedroom was very hot impacting the sleep we actually got. The lock on the bathroom door didn’t work, meaning no privacy. The lack of reception hours means that staff are hardly there, therefore it was very hard to get a hold of them if you needed anything. If you need a place to sleep and everything else is booked then I guess this is fine. I immediately didn't like the place but since it was Easter weekend I had no choice. The price was not worth what you were paying for. I have stayed in nicer and cheaper hostels in Italy. The reception desk lady barely spoke english and was not helpful. I feel like she over charged me but after the third time asking I just gave up and payed. My bed was practically on the floor but they did give you towels. I found it very difficult to get in touch with the staff here, we needed to use the laundry facilities as this was the only hostel in our trip that had laundry. It took a few hours for them to respond by which time we were already working on finding other facilities. The bed wasn't at all comfortable and the room was very damp.